All diamond shapes other than round are referred to as "fancy shape" diamonds. You should include all of the 4C's - cut, color, clarity and carat weight when evaluating your diamond shape. Additional factors need to be evaluated when considering fancy diamond shapes such as: the length to width ratio (proportion), overall appearance and the "bow-tie" effect. Finally, how does shape affect the price? 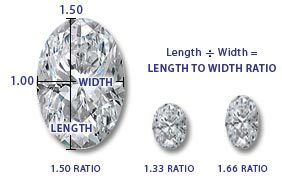 When looking at fancy cut diamonds evaluate the length-to-width ratio. Although look is subjective, too long or too short proportions of the stone can look awkward. Make sure that the diamond shape is appealing to your eye and that it is symmetrical. One-half of the diamond should be shaped exactly as the other half. Girdle widths will vary much more on fancy shape diamonds, especially on marquise, pear and heart shapes, where the girdle tends to be thick at the tips of the stone. The bow tie effect can be seen without magnification and is found in marquise, oval, pear and some heart shape diamonds. It happens from variations in the pavilion facets required in cutting stones that are longer than they are wide. The bow tie looks like two dark triangle shapes joined at the point in the center of the diamond. This is caused by light leaking from the stone and is considered to be a negative if it's prominent. It can be caused from an overly deep pavilion. In a well cut diamond this effect should be minimal and not a distraction. We apply our same high standards when selecting your fancy shape diamond as we do for your round diamond. We offer only those diamonds that meet our 4c's, length-to-width proportions, girdle thickness requirements and ones with minimal bowtie effect. We also offer GIA certified fancy shape diamonds. You can rely on our expert guidance to select your perfect diamond. The princess cut is called a square/rectangular modified brilliant in GIA grading reports. Although a relatively new cut, it is our most popular fancy shaped diamond and often finds its way into solitaire engagement rings. Flattering to a hand with long fingers, its square shape shortens the appearance of a longer fingered hand. Princess rings are often embellished with triangular stones at its sides. Because of its design, this cut requires more weight to be directed toward the diamond's depth in order to maximize brilliance. It may have either 50 facets (21 crown, 4 girdle, 25 pavilion) or 58 facets (21 crown, 4 girdle, 33 pavilion), depending on how the pavilion is cut. Princess shapes of high cut quality usually have a table percentages between 66-74% and a total depth percentage between 64-75%. For square princess diamonds that are pleasing to the eye, look for length-to-width ratios between 1.00 and 1.05. For a rectangular look, ratios of 1.10 to 1.20 are good. Expert Guidance - The princess diamond cut has sharp, squared-off corners, and if the girdle is extremely thin in these areas, chipping or cracking may occur more easily. Color may be slightly more visible in the corners of the princess diamond, so when selecting the color of your princess, go one grade up vs. a round diamond. For a square princess, look for a length-to-width ratio between 1 and 1.05, which will look perfectly square. For a rectangle princess diamond, look between 1.10 and 1.20. These diamond shape proportions will give an emerald look with the brilliance of a princess cut. Princess cuts make excellent choices for earrings. Whatever the proportions of your diamond, if you love the appearance, you have chosen wisely. The emerald cut diamond shape is not a brilliant cut, but is called a step cut. Step cuts are comprised of larger, planar facets that resemble stair steps, which act like mirrors. The emerald cut has 58 facets, with 25 crown, 8 girdles and 25 pavilions. Because of the angle, size and shape of the facets, the emerald cut shows less brilliance and fire (dispersion) than the other brilliant and modified brilliant cut diamonds. However, the emerald cut stone reveals a classic and aristocratic elegance and beauty not seen in other cuts. For Emerald diamonds that are pleasing to the eye, look for length-to-width ratios between 1.30 and 1.65:1.00. Expert Guidance - Because of the open and large, step facets, we recommend that you stay at higher color (D-G) and clarity (IF-VS2) grades than you might with a brilliant cut stone, because lower color and clarity grades will be more noticeable. Also, check to make sure that all the facet edges appear parallel in the face-up position, if they are not, they are generally not as appealing. The emerald cut offers a touch of regal elegance as the center stone in a ring, and the most attractive proportions are a length-to-width ratio range of 1.30-1.65:1.00. However, some women prefer a squarer look with a ratio in the range of 1.05:1.00. Obviously, the more square the shape, the more it compliments the longer-fingered hand, and the more rectangular, the better suited it is to the shorter-fingered hand. The better emerald cut diamonds, like radiant, will have table percentages between 59-75% and total depth between 62-74%. The oval shape is an even, perfectly symmetrical design popular among women with small hands or short fingers. Its elongated shape gives a flattering illusion of length to the hand. A brilliant style of cutting very similar to a Round except it is elliptical. The oval is most frequently cut in the standard 58-facet brilliant pattern, but again can have a varying number of pavilion facets ranging from four, six or eight. Beware of uneven or high shoulders (they should have a gently but distinctly rounded arch). For oval diamonds that are pleasing to the eye, look for length-to-width ratios between 1.33 and 1.66. Expert Guidance - For ovals, look for even, well-rounded ends with a full body having an optimal length-to-width range of 1.33-1.66:1.00. This shape of stone in a ring accents finger length, and works nicely as stud earrings. Higher cut quality ovals, as with the marquise and pear, have table percent of about 53-63% and total depth percentage's of 58-70%. The pear shape diamond is a hybrid cut, combining the best of the oval and the marquise, it is shaped most like a sparkling teardrop. The pear shape, like the marquise, usually has the 58 facet brilliant pattern, but can also be cut with different numbers of pavilion mains of eight, seven, six or four facets. This diamond shape most complements a hand with small or average-length fingers. It is particularly beautiful for pendants or earrings. Shoulders should have a gently but distinctly rounded arch. To understand what the diamond will look like on your finger; look for the length-to-width ratio on each diamond's detail page. For a pear-shaped diamond that is pleasing to the eye, look for a length-to-width ratio between 1.40 and 1.65. Expert Guidance - Look for a well-shaped head and even shoulders with an optimal length-to-width range of 1.40-1.65:1.00. This shape in a ring will make the fingers appear longer. Pear-shaped diamonds work equally well as pendants and are exceptional as drop earrings. Well cut pear shape diamonds will have a 53-63% table percentage range and total depth percentage of 58-65%. An elongated diamond shape with pointed ends inspired by the fetching smile of the Marquise de Pompadour and commissioned by France's Louis XIV. The marquise (pronounced "mar-KEYS", not "mar-KEY") is usually cut as an adaptation of the 58-facet standard brilliant, with the crown having 33 facets and the pavilion 25 facets of the same type as the round brilliant. However, the pavilion can be cut with four, six or eight pavilion mains facets, depending upon the stone's girdle outline. Look for length-to-width ratios between 1.75 and 2.25 for marquise-cut diamonds that are pleasing to the eye. Expert Guidance - It is gorgeous when used as a solitaire or when enhanced by smaller diamonds. This shape is used to maximize carat weight in the setting and give it a long, slender appearance. 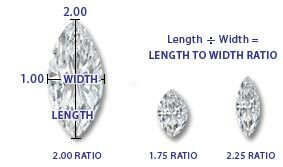 The length-to-width ratio is important to a stone's appearance, and for the marquise shape the preferred range is 1.75-2.25: 1.00. Marquise diamonds frequently show a bow tie, so try to find a stone in which this is minimal or absent. This shape of diamond in a ring accentuates the length of the fingers. The Heart shape is the ultimate symbol of romance and is essentially a pear-shaped diamond with a cleft at the top. Look for a stone with an even shape and a well-defined outline. The length-to-width ratio should ideally be 0.90 - 1.00. Because most heart diamonds are almost round, they can be cut similar to round brilliant cut for maximum fire. This shape is seen frequently in pendants, but is suitable for most any purpose. The well-cut heart shaped diamonds will have a table percentage in the 53-63% range, and a total depth of about 58-65%. Diamonds cut to these standards will offer the most fire. Look for length-to-width ratios between .90 and 1.10 for heart-shaped diamonds that are pleasing to the eye. Expert Guidance - In a heart cut it is important to look for a perfectly symmetrical appearance where the lobes (top arches) are of even height and breadth, and the overall shape pleasing. The better cut heart shapes will have a length-to-width ratio of just about 0.98-1.02, with a little variation from about 0.90:1.00 to 1.10:1.00. This square or rectangular cut diamond shape combines the elegance of the emerald shape with the brilliance of the round, and its 70 facets maximize the effect of its color refraction. Because of the design, this cut also requires more weight to be directed toward the diamond's depth in order to maximize brilliance. Depth percentages of 70-78% are not uncommon. The radiant cut is called a cut-cornered, square/rectangular (depending on the overall shape) modified brilliant on GIA grading reports. It has 70 facets, 25 on the crown, eight girdle and 37 pavilion facets. Expert Guidance - The truncated corners may aid in avoiding or minimizing possible chipping problems posed by extremely thin girdle widths in these areas of the stone. Generally, a ring with a square cut radiant tends to shorten the appearance of the longer fingered hand. Radiants of higher cut quality will have table percent of about 70-77% and total depth %'s ranging from about 69-89%. Diamonds that are cut to these standards will offer the best fire or sparkle. Radiant shape diamonds can be special ordered. Call one of our diamond and jewelry consultants for assistance at 1.877.404.RING or if outside the U.S. and Canada, call 001-804-794-1118. Cushion-cut diamonds (also known as "pillow-cut" diamonds) have rounded corners instead of Sharp Pointy corners like Princess Cut. Cushion Cut has larger facets to increase their brilliance. These larger facets highlight the diamond's clarity. A cushion cut diamond shape could be a square or rectangular cut with rounded corners and 58 brilliant-style facets that resemble a pillow shape. 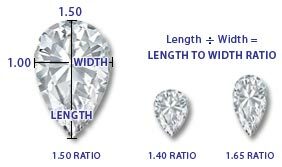 The length-to-width ratio will determine the diamond's over all shape, or what it will look like when viewed from the top. 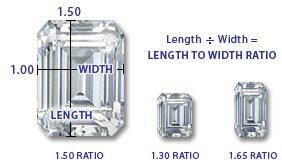 For a Square Cushion-cut diamond, you have to look for length-to-width ratios between 1 and 1.05. If you prefer more of a rectangular shape, look for length-to-width ratios greater than 1.15. Cushion cuts are a little less brilliant than modern round brilliant diamonds, but are more dispersive (which refers to the separation of white light into spectral colors). Expert Guidance - Cushion cut diamonds seem to blend in every style of engagement ring from the antique settings to the contemporary pave settings so they are a great choice for a fancy diamond shape if you want something a little different but still require brilliance and sparkle. It has a marvelously romantic and classic look and definitely stands out from the crowd of round brilliants. A 57 facets diamond, the Asscher cut diamond was developed as an alternative to the most common Round Brilliant Diamond Shapes. This beautifully unique diamond shape has facets that are identical to the Emerald-cut. Similar to the Emerald cut, the Asscher cut has large step-cut facets. However, its facets are larger than those of the Emerald cut, and its shape is more of a square as opposed to the rectangular. Also, this shape has a pavilion that is cut with rectangular facets in the same style as the emerald-cut. All Asscher-cut diamonds will appear square, because each one would have a length-to-width ratio between 1.00 and 1.05. With its smaller table, higher crown, deeper pavilion, faceted culet, the Asscher was created to do more than just highlight larger stones. The Asscher is designed to illuminate their inner fire, while its small table and high crown bring out more fire and scintillation than the similar Emerald cut. Expert Guidance - The broad, flat-faceted step cut nature of the Asscher allows for tremendous luster and brilliance. This is definitely one of the many cuts of diamonds for those who wish to express a sense of elegance and beauty. The trillion shape diamond is a spectacular wedge of brilliant fire. First developed in Amsterdam, the exact design can vary depending on a particular diamond's natural characteristics and the cutter's personal preferences. It may be a traditional triangular shape with pointed corners or a more rounded triangular shape with 25 facets on the crown, 19 facets on the pavilion and a polished girdle. Expert Guidance - The trillion is a triangle that has equilateral sides and is a combination of the step cut and the brilliant cut diamond, and when cut correctly, has a wonderful brilliance. They are often cut shallow and often look large for their carat weight. Trillion diamonds are beautiful when flanking a center diamond, or in a more avant-garde piece as a center diamond. A matched pair also creates beautiful earrings. The baguette is a step cut style used frequently as side stones. Baguettes have unbeveled corners, usually only two rows of facets and may be rectangular or tapered. Like the emerald cut, the baguette does not have the sparkle of a brilliant cuts but has a classic beauty. Expert Guidance - Higher color and clarity are important because there are no facets to hide inclusions or body color. Now that you’ve learned all about diamonds; use your knowledge to shop for your perfect diamond engagement ring.